Who needs Mad Mel and Cruisazy Tom? Memo to Hollywood: Stop paying big bucks to controversial stars and focus more on stories and visual effects instead. NEW YORK (CNNMoney.com) -- Quick. Name one actor who starred in "The Chronicles of Narnia." Stumped? How about naming who plays Clark Kent and Lois Lane in this summer's "Superman Returns?" Unless you work in the movie industry (or you're a total IMDB.com junkie) odds are that the names Brandon Routh and Kate Bosworth didn't instantly pop into your head. And forget about trying to come up with the names of any of those British tykes from Narnia. 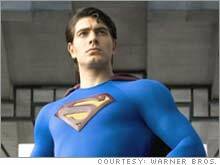 Brandon Routh, who plays Clark Kent and the Man of Steel in "Superman Returns" is not a big star. But "Superman Returns" has still made nearly $200 million at the box office. 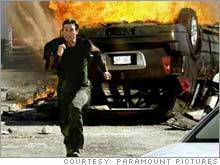 "Misson: Impossible III" was a box office disappointment and many blame the strange off-screen behavior of Tom Cruise. In the past, Cruise was thought to be a big box office draw. There's this misguided notion in Hollywood that a movie needs a star in order to do well. But Narnia was the second-biggest-grossing film of 2005, taking in more than $290 million for Walt Disney (Charts). These are hardly exceptions to the rule either. For the past few years, monstrous box office hits have often been based on comic books, novels and sequels. And most of them have not had featured well-known actors and actresses. The characters and stories have driven the film's success. Seriously, would Spider-Man 2 have flopped if, as once rumored, Jake Gyllenhaal wound up replacing Tobey Maguire as Peter Parker/Spidey? "Many of the highest grossing films of the past few years were not star-driven vehicles. They were based on a comic book or a literary franchise," said Gitesh Pandya, editor of BoxOfficeGuru.com, a movie industry research firm. "Look at Harry Potter. They could have cast anyone in those films. And who knew Orlando Bloom before 'Lord of the Rings?'" These days, big stars may be more trouble than they're worth. Hopefully, major movie studios will adjust salaries accordingly for the sake of their own financial health. Why should any studio consider paying Tom Cruise big money to star in a movie? Many entertainment analysts blame Cruise's increasingly bizarre off-screen antics for the disappointing box office take for "Mission: Impossible III," which was released by Viacom's (Charts) Paramount studio. Cruise has gone from being a guy who people couldn't wait to see in a new film to one that alienates a large portion of moviegoers. Can you imagine Mel Gibson getting a big payday ever again after his drunken anti-Semitic rant? People that were hoping for "Lethal Weapon 5" or another Mad Max movie better not hold their breath. And why should Lindsay Lohan, who was given the equivalent of a public flogging after a letter from a studio chief urging her to stop her late-night partying and show up to work on time was leaked to the press, ever get a huge paycheck to be in a film? Lohan may be queen of the gossip pages but she's hardly a box office draw; the only movie she's been in that's grossed over $100 million was "Freaky Friday" back in 2003. "Studios are struggling with the value of star power and trying to figure out who's worth money and who's not worth money," Pandya said. "They are debating how many instances do you need to pay $20 million per star for a movie?" I think it's silly to pay that much money for an actor. Simply put, a big actor does not guarantee box office. One professor who follows Hollywood said that he thinks star salaries may decline a bit in the wake of recent scandals but that studios will still hand out big paychecks. "I've always scratched my head about what studios are wiling to pay stars. But it's still the conventional wisdom that you need stars in order to ensure that a certain number of people would show up for an opening weekend," said Charles Merzbacher, an associate professor and chairman of the Department of Film and Television with Boston University. Still, more studios should take a page from HBO's Hollywood-themed "Entourage." For those of you who don't follow the show, the main character was the star of a successful "Aquaman" movie. But after demanding big bucks to star in the sequel, the studio dumped him. Sure, "Entourage" is fiction. But there's a grain of truth in it. "Stars do not really drive the financial success of films," said S. Abraham Ravid, a professor of finance and economics at Rutgers University who has studied the economics of the movie business. In fact, Ravid said he's found in his research that there is a bigger correlation between how much a studio pays for a screenplay and how well the film does than whether or not the movie has a well-known actor or actress in it. And Pandya thinks it's worth noting that many of the biggest hits of the past decade, particularly the action movies, have featured stunning visuals. "The real stars are the special effects artists. Those are the guys worth paying money for," he said. Of course, some actors and actresses still have legitimate box office power. It's hard to imagine, for example, how big of a hit Disney's two "Pirates of the Caribbean" movies would have been if not for the eccentric portrayal of Jack Sparrow by Johnny Depp. And I doubt that Sony's (Charts) "Talladega Nights: The Ballad of Ricky Bobby" would have grossed $47 million last weekend if the lead actor was actually John C. Reilly instead of Will Ferrell. Even so, stars often have to live up to a defined role in order to have a hit. Ferrell playing a lovably clueless NASCAR driver obviously appealed to the people who can quote Frank the Tank lines from "Old School" and Ron Burgundy-isms from "Anchorman" by heart. But Ferrell as the straight man in a cheesy movie version of "Bewitched?" Not so much.